26 | November | 2010 | can i just finish my waffle? 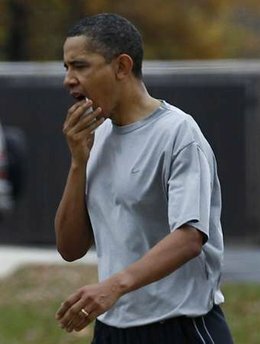 Obama gets 12 stitches in his lip. First commenter on Gateway Pundit says, “why did they stop there?” I thought it was funny. Can’t help but remember Tiger Woods’ little accident last year on black Friday. I wonder if there’s more to be revealed about this. Nah. But in this day of lies and spin, nothing is to be believed, especially coming out of this white house. This also made me think of Joy Bahar saying last year she thought black Friday was racist. And she was serious.